Citation Information: J Clin Invest. 2005;115(7):1828-1838. https://doi.org/10.1172/JCI22954. Inhibitors of HIV protease have been shown to have antiapoptotic effects in vitro, yet whether these effects are seen in vivo remains controversial. In this study, we have evaluated the impact of the HIV protease inhibitor (PI) nelfinavir, boosted with ritonavir, in models of nonviral disease associated with excessive apoptosis. In mice with Fas-induced fatal hepatitis, Staphylococcal enterotoxin B–induced shock, and middle cerebral artery occlusion–induced stroke, we demonstrate that PIs significantly reduce apoptosis and improve histology, function, and/or behavioral recovery in each of these models. Further, we demonstrate that both in vitro and in vivo, PIs block apoptosis through the preservation of mitochondrial integrity and that in vitro PIs act to prevent pore function of the adenine nucleotide translocator (ANT) subunit of the mitochondrial permeability transition pore complex. 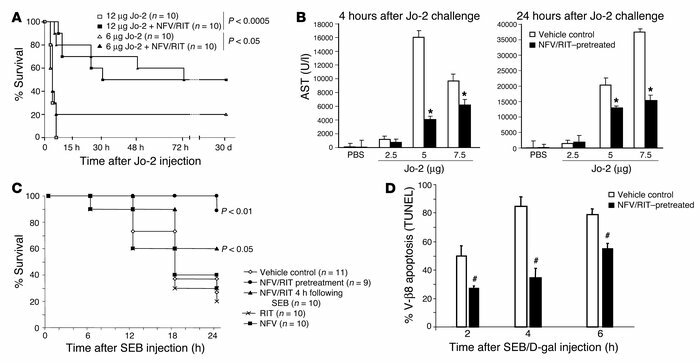 Effects of NFV/RIT on Jo-2–induced hepatitis or SEB-induced shock. (A) Mice treated with varying doses of Jo-2 antibody in the presence or absence of NFV/RIT were followed for 30 days and analyzed for survival. (B) In parallel, mice treated in a similar manner were sacrificed at 4 or 24 hours and analyzed for serum AST level. *P < 0.05. (C) Five mice per group were treated with SEB/D-gal with or without NFV/RIT before or 4 hours after SEB or with NFV alone or RIT alone before SEB. Twenty-four-hour survival was monitored (cumulative data from 4 independent experiments are shown). (D) Mice treated with SEB/D-gal with NFV/RIT or control were analyzed for V-β8 T cell apoptosis by TUNEL assay (cumulative data from 4 independent experiments are shown). #P < 0.01.